Jackie was due back at UCSB today, but she still wanted to get some last-minute rock climbing in. Gibraltar Rock is a semi-popular rock climbing spot in the hills behind Santa Barbara, just off Gibraltar Rd, about 40min from school. Moving in was a much easier affair on her sophmore year compared to the previous one. Her first move-in had been a much bigger affair that took Mom, Dad and half a day to unload, set up her room, have lunch and then tearful goodbyes. This time, it was just Jackie and Dad with far less stuff, taking us about 30min to unload before heading off to go climbing. She could unpack it all when she got back after I left. Priorities are important. We had been to Gibraltar Rock the previous November, but that was just a quick visit while we were there to do another hike. We parked in the same shady turnout on the east side of Gibraltar Rd, then crossed the road and climbed the short use trail to the top of Gibraltar Rock. There are three bolts found at the summit. We used two of these with some long webbing to set up a rappel/top-rope, then one after the other we rapped off the south side to the bottom. 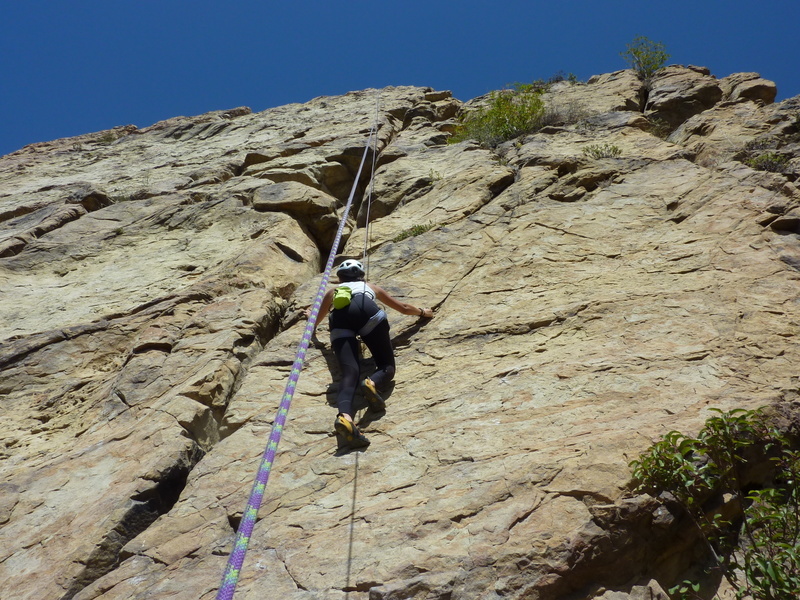 The impressive South Face is a 30m sloping, knobby affair, a good place to bring beginners. The sandstone face has varied features and can be made as easy are hard as one might like. There is a large crack/chimney with huge hold that make one feel safe, as well as small finger holds for greater challenge. Our rope barely made it to the bottom on rappel and it was just long enough to top-rope each other for climbs up the face. We each made three climbs, which turned out to be plenty in the warm sun with temps in the high 70s. The rock was almost hot in places on the exposed face and seemed to sap one's energy far more effectively than on cooler days.